This lovely one of a kind Metropolitan studio loft is located in Cave Creek's Tatum Ranch. 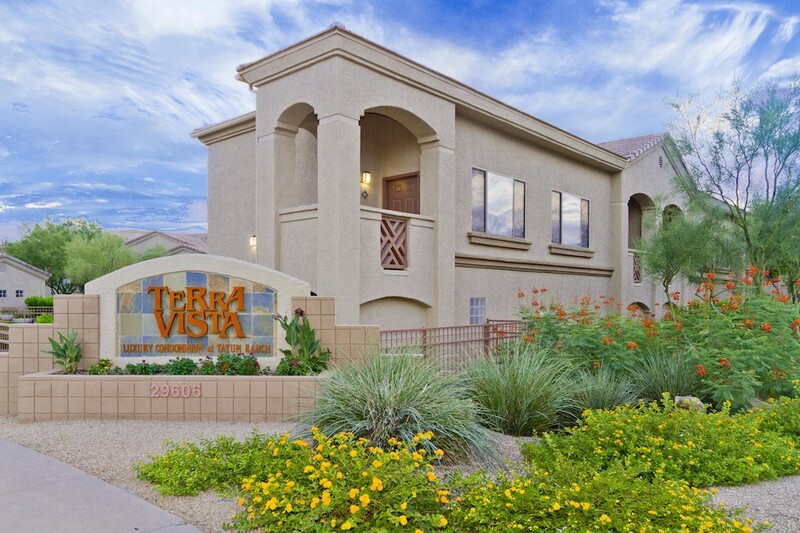 Cave Creek is a wonderful location just minutes from Scottsdale and many popular events like the TPC Waste Management Phoenix Open, The World Famous Barrett Jackson Classic Car Auction, Various Equestrian Events and MLB Spring Training. Cave Creek also has some of the best "Wild West" styled saloons like Harold's, The Buffalo Chip and Greasewood Flat. The Acacia Loft studio has everything you need all in one space without any real defined boundaries. Walking through the front door you will immediately feel the modern energy from the vibrant orange and chartreuse painted walls. You will feel as if you walked right into a modern show piece! Although the unit is less than 900 square feet you will never feel cramped or out of space. Each unique area has been thoughtfully designed so that you have all the items needed to feel right at home. The Kitchen has beautiful dark colored granite counter tops with deep maple wood cabinetry and brand new black on black appliances. Kitchen includes a built in island bar with two bamboo stools, blender, coffee maker, toaster and all the items needed to prepare your meals. There is even a small desk area where you can set up your lap-top just in case you need to tend to some business during your stay. The lounge area has been tastefully furnished with a black leather sofa, a white leather arm chair, a beautiful dark alder wood coffee table and a set of nested dark alder wood tables. There is a beautiful console table behind the sofa with a "Julius Caesar " head sculpture, a change dish and a hurricane style candle holder. The room includes a wall mounted 42" flat screen TV and a lower media cabinet with a Blu Ray DVD Player. The sleeping area is furnished with a Queen size low profile bed, a matching wall mounted wood framed mirror and a magazine stand for your reading materials. Fall into slumber on the rust colored bedding set with beautiful decorative accent pillows, and an adjustable bed tray that moves easily from the foot of the bed right up to head of the bed just in case you want to return an email or have breakfast in bed. The bathroom has a granite single sink mirrored vanity with plenty of drawer and cabinet space below, a walk in glass door shower, commode and a large walk-in closet. The community has a heated pool, spa, gas grills, fitness center and business center. Grab some steaks and grill them up pool side while you kick back with a glass of wine and relax. The state of the art fitness center has everything from cardio machines to free weights. Walk over to the shopping center just next door and enjoy Babbo's Italian restaurant or head over to the Fry's market and make your own gourmet feast. The possibilities are endless. The loft includes a single car garage below, a stackable washer / dryer set, high speed wireless internet and cable TV. You will not be disappointed in this lovely Cave Creek Loft! - Art Festivals / Wine Tastings and More!